In the competitive world of baby products, we tend to try most of the brands and range of products since we want the best for our li'l one. I was sent over a packet of Teddyy Premium Diapers (Size L) 34 No.s for my li'l one by the brand. Honestly, I had not really heard of Teddyy diapers before this, though I have heard of their adult diapers - FRIENDS because we had someone in our extended family use them. The packaging is compact with the perforated plastic opening to remove diapers. The bes thing is that Nobel Hygeine, unlike most of it's competitors like Huggies or Pampers is an Indian born company, headquartered in Mumbai. It is a proud feeling to know that. With high absorbency and being extra-soft, the Premium diaper stands apart from the Easy range. The diaper comes in both taped and pant style. They even have changing mats available for purchase, which is great specially for the initial months of the baby's life. The material on the diaper is really quite soft, with cute cartoons printed all over. The elastic is quite snug, making the diaper cling to the baby. It does great overnight, and even after a few hours when I remove it, it is light weight which tells a lot about the absorbency. But of-course, if it stays on for too long it can leak. Happened a couple of times. I found the elastic tighter than the competitors, and my baby is on the leaner side, so it works for him. 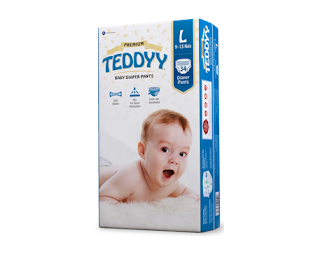 If you go to compare the pricing, Teddyy Premium diapers are around Rs.100-Rs.150 (per packaet) cheaper than the premium range of competitor brands. I used the diaper for my son daily for a week before writing this review and have not seen any rashes or skin discomforts so far (which is my major concern whenever I try a new brand, specially that I have never heard of before). They're also available online on their own site as well as top eCommerce sites at competitive prices. I would recommend parents who want to give a premium diaper solution at an affordable price to try these.